Now this is the thing with Groupon, it’s always an adventure. This Groupon adventure begins with the fact that I desperately needed a manicure and pedicure after weeks of hiding my toes in ballerina flats. I had just returned from NYC where you can get a mani/pedi for $15-20, and I stumbled upon a promotion by Matisse Hair, which is conveniently located within my beloved Coconut Grove. The promotion was: “Essie/OPI manicure and pedicure with pressure point foot massage” for $25, so I bought one for myself and another for my kid because I really wanted to check out this massage part. I called ahead of time, spoke with the owner, and she told me that the massage would only be a minute and it was to promote their pressure point foot massage. 1 minute? Try not at all. We went and the manicurist, Ildeña, was lovely, she did a great job on my manicure and pedicure (it involved a great massage chair and a cool callous removing power tool that looks like a sander). I chose a snazzy medium to dark blue from some obscure brand that has lasted a week already (I will find the brand and report back), but my daughter used a mint color from Dare to Wear which barely lasted 24 hours (Ildeña had forewarned me that this might happen with this brand). The place has a great vibe, they have cool beds where they wash your hair if you’re opting for hair services. They are reasonably priced. As far as the massage, well, when I sat down, Ildeña told me that she’s not trained to give pressure point foot massages and does not do them. So I got over that and enjoyed the rest of my visit, which has allowed for my toes to go public once again! This entry was posted in Beauty, Cool Places on July 30, 2014 by admin. Nearpod: the wave of the future that’s here now! Let me tell you about a little treasure I found, well I found it thanks to FIU and Dr. Patricia Barbetta. It’s called Nearpod. use a wait time to have students think before answering and also allow their students to answer so it’s not always the same students. Well, Nearpod does all that and more in one place. Nearpod allows you to create presentations using your own library of PDFs or PowerPoints, as well as Nearpod’s library (teachers can ask to create lessons for them and it pays!). Teachers then share the lessons with students and control their activity in real time, (which keeps them from surfing onto different webpages because the teacher has the nifty master control indicating students that are actively involved or not!). This programs allows teachers to request all-pupil responses and assess their students’ understanding of the lesson without the students experiencing the pressures of answering out loud. Students who need more time can be assigned this lesson as home learning, and they can review it independently at their own pace…because yes, Nearpod creates a flipped classroom. This program is easy to use and has been picked up by some big school districts already, and given a variety of awards for the quality and effectiveness of their product. Nearpod can be used on any platform, which is relatively unheard of. A little more about Nearpod…the creators are based out of Miami, Florida, and they provide the best customer service; you run into any issues or have any suggestions, well these folks are very open to that because they are constantly improving their incredible product. I’m a big fan as you can see…and I’m a fan that’s a parent, a teacher, and more specifically, a special education teacher. This product meets the needs of many students so check it out! This entry was posted in Accessing Education on July 26, 2014 by admin. 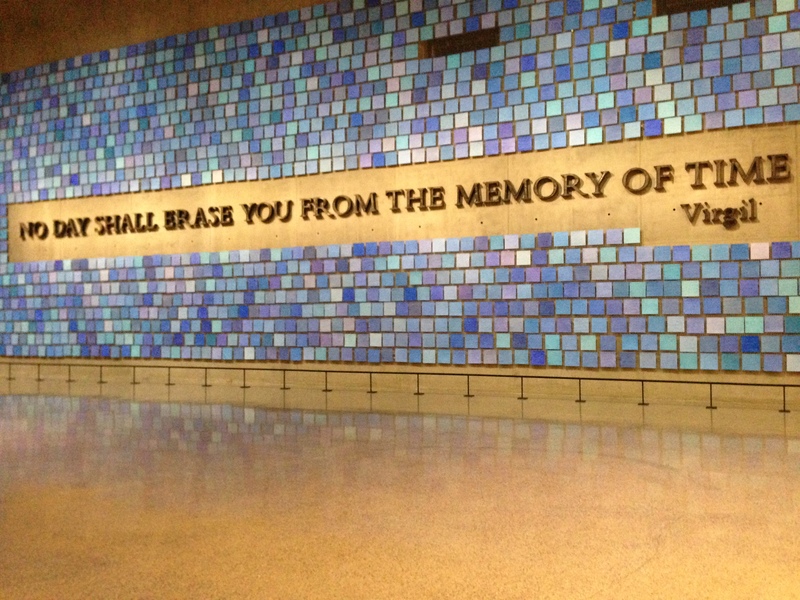 On our second day, the first place we headed to was the 9/11 Memorial & Museum, which has been at the center of a lot of controversy. It’s an emotional experience as you would anticipate. When you first step onto the plaza, you will probably be facing one of the two enormous reflecting pools where the towers once stood. They each measure about an acre and have 30-foot waterfalls that cascade beautifully throughout multiple levels. As you walk along the perimeter of the reflecting pools, you will notice the names of the victims engraved in bronze on the sides…it was impressive and gave us chills. I would almost say that you feel a presence. Once inside, the feeling of loss becomes increasingly present as you walk through what feels like catacombs. You will see some of the steel beams where the planes hit, and the last one that was found, the 36-foot “Last Column” which became a tribute to all, but especially the rescue workers; it was the biggest urban rescue effort nationwide and most of them died valiantly as they did everything they could to help people get out. You will walk by the wall, referred to as “the bathtub”, that had it collapsed, would have led to downtown Manhattan being under water. You will walk next to the stairs where people were being told to “run fast, as fast as you can”. 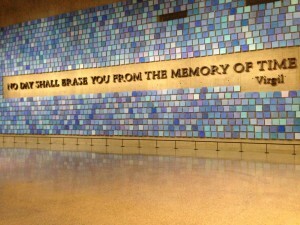 You will see Brooklyn-artist, Spencer Finch’s, Trying to Remember the Color of the Sky on that September Morning, which is an installation comprised of square papers, representing each of the victims, in different hues of blue to represent the color of the sky that morning on 9/11. It was an incredible piece. There are interactive touchscreen memorials, where you can search for a loved one, hear about them, and see their picture. I chose to filter the search to victims from Florida, where I stumbled upon the picture and history of Bernard C. Brown II…he was from Leckie Elementary School in Tampa. He was 11; born June 19th, 1990. He was on Flight #77 to California because he had been chosen for a trip sponsored by National Geographic to visit a marine sanctuary. I can’t tell you how it felt to see his smiling face and know that he never reached his destination. You can hear about the history of every victim. I remember that day clearly – my daughter, then 2, sitting on my lap as we and the rest of the country watched on the day that changed our realities forever, and as my family, who worked in the city, walked home to Brooklyn that day as ashes fell on them. Those of us that are old enough to remember, will never forget that day, where we were, what we did, who we lost. When you go, you don’t need to get an audio guide, just download the free museum app. If you’re a student, take your ID everywhere! If you are family of a victim, your entry is free. Here are the prices: Tickets. This entry was posted in Cool Places, Travel on July 23, 2014 by admin. I’m going to have to break this up because it’s NYC and therefore, amazing. I’ll get right to it after I complain about the taxi driver that ripped me off (you know who you are cab #8N21 that picked up unsuspecting victims from LGA around 9 a.m.! )…I know – I have Waze (great app) and you took the route that wasn’t even on there! Moving on…I arrive at the Highline Standard — Joel and Weezer (I think that’s his name — blondish, cool beard, and very easy on the eyes) demonstrated amazing customer service– above and beyond. Our view overlooks the Highline and the Hudson…I can’t tell you how spectacular today’s sunset was. It’s The Standard — chic, hip, awesome location…all that good stuff. 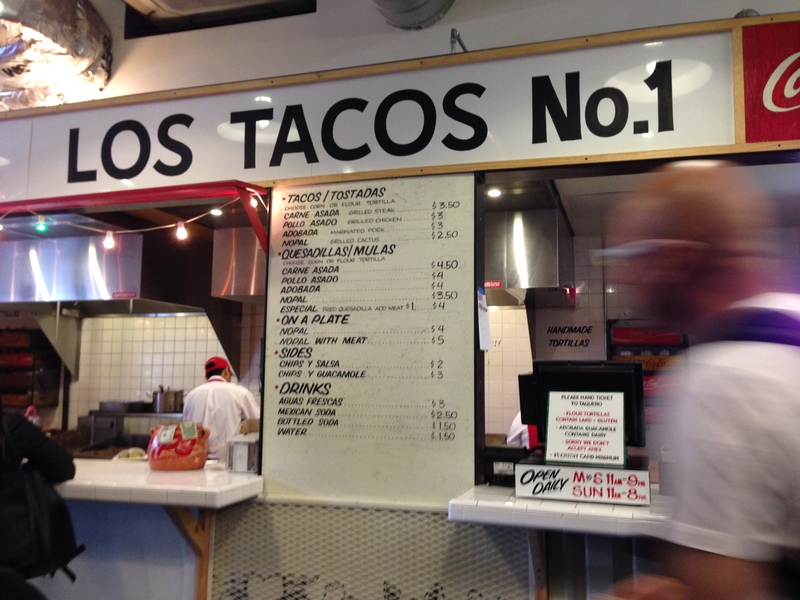 So I’m starving…we head to the Chelsea Market – great stores, restaurants, etc…we find a stand Los Tacos No.1 and they are #1…get an adobada on a corn tortilla with everything on it — incredible. 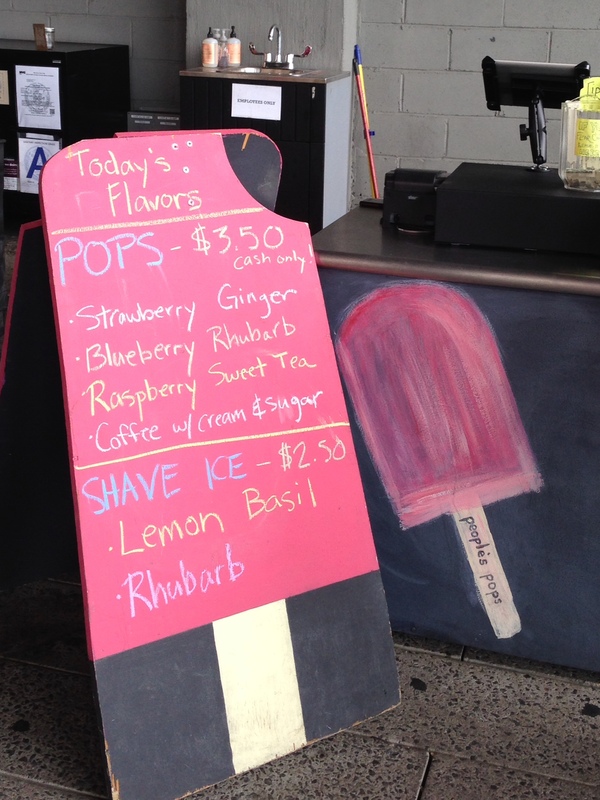 Now that my belly’s happy, we head for the Highline, which I love (it’s a cool park overlooking the city), and if you walk enough, you’ll stumble on vendors and food stands that include: Blue Bottle Coffee and People’s Pops (try the Blueberry Rhubarb! ), among others that I’m sure are equally great. We relaxed a little at our lovely hotel and then headed back out. The Standard Grill – delicious and refreshing watermelon and cucumber salad on a bed of guac, wonderful fries, scrumptious mushrooms, and the rudest waiter. Then, we found Perfect Brows, a threading shop at 316 West 14th Street, between 8th and 9th. As a walk-in your wait time is less than 5 minutes, and you are done in 5 minutes. $7 for eyebrows and $5 for the upper lip. Great, great deal! Then, finish off with a sunset walk on the Highline and if you’re lucky you may see fireworks over the W from your room. This entry was posted in Cool Places, Food, Travel on July 17, 2014 by admin. I admit: I have a flair for the dramatics. I’m a little hyperbolic according to my mother, and I tend to overreact…you know, sometimes. With my studies, I was/am overly critical of myself. An A- feels like an F. Etc. So, imagine how I get with family. When my kid was a few weeks old and her umbilical cord had dried up and was falling off, I almost called 911. So when my pug recently became ill, I almost took her to the local animal hospital that specializes in highway thievery, but I managed to get a hold of myself and waited until the next morning. She has two vets that are both amazing and have each helped her out of some tough times. Trail Animal Hospital and Gomara Animal Clinic are the only ones I trust with my Daisy, who according to everyone’s observation, seems to be my favorite from the family…I won’t admit or deny that though. This entry was posted in Cool Places on July 13, 2014 by admin. Good, meaningful relationships take work, sacrifice, communication, hugs, love, and yes, a couple arguments peppered in. This rule doesn’t just apply to good and meaningful relationships with significant others, children, families, and friends. Oh no, I’m here to tell you that this rule also applies to the often under-appreciated heroes in your life: your plumber, electrician, gardener, cleaning lady, and yes, your hairdresser. I would also like to remind you that your hairdresser or hair guru, as I refer to mine, often has to deal with you when you are not in tip top emotional OR physical shape. Take my hair guru, Cynthia, I sent her some crazed text message at 9 p.m. a few days ago telling her “I need to change my hair because my roots are driving me nuts and I feel old”, she laughed and scheduled me immediately. I walked in with a blah mood after a tough morning, she gave me a hug, offered me tea, and confessed how happy she was that I had finally come around (I was being a little stubborn hoping that my hair would naturally become like Rogue’s from X-Men, but it was beginning to look more like Adela, the grandmother from ¿Qué Pasa, USA?). An hour later, I walked out in a much better mood, and with a youthful, vibrant, healthy head of hair — she’s magical (ask my family and friends – they’ll tell you I was looking a little crazy)! About Cynthia: she has a great eye for color and highlights, she is an artist, demonstrates enormous professionalism, and her prices are more than fair (if you have long hair, as I do, you may possibly incur an extra charge, which is fair so get over it). You can always find another girlfriend or boyfriend, but a good hair guru, well, that’s tough to find! Here’s Cynthia’s information: (305) 753-2001, she can often be found at Paul David salon, which is next to Duffy’s (great burger and beer, but that’s another blog) on SW 57th Avenue & 19th Street. This entry was posted in Beauty on July 11, 2014 by admin. The last few days have been tough for my family…the final link from the older generation passed away last week. My great-aunt always had a smile, a dark sense of humor, and was a confidante to many. The great thing about being part of a crazy family is that we manage to laugh at the darkest hours, always a good tool to possess given the cheesiness and money-hungry feel from funeral homes. You hope for Michael C. Hall from Six Feet Under; you get a woman with too much hair spray and make-up, a thick accent, and a polyester suit, engrossed in a phone conversation, ignoring your tear-stained face, a dress belonging to the deceased hanging on your arm, and giving you attitude because you’re trying to get her attention. Really? Really. That was the beginning when my cousins first arrived to make arrangements. Let’s move forward in time to the wake. A wake – we (most Caribbean islanders) are a passionate people; we scream, we cry, we faint on command, and we throw things and that’s when we’re happy. So, when other people have quick memorial services, we prefer pulling an all-nighter with an open-casket, inviting long-lost family members, encouraging dramatic moments, and offering an unlimited supply of Cuban coffee. At some point during wakes, a priest will come, and do his thing (I have no idea what that thing is because I grew up with an atheist father). Our family, however, asked one of our priest-like cousins to lead the crowd in a memorial of sorts for my great-aunt; it was heart-felt, sincere, funny, sad, and great. But apparently, no one gave the actual priest the memo that his services weren’t needed today so he came in 30 minutes later, demanding to be heard, and we all stared. Really? Really. That was the wake. Now let’s move to the burial. With most of the inner circle present, we said goodbye before the casket was closed. It was probably the toughest moment. My cousins went in the non-hearse vehicle while the rest of us carpooled to the cemetery. We took the Palmetto through Hialeah, which was adorned with billboards recommending you get a derriere lift or a breast enhancement. We all went in a procession towards the mausoleum where she would be buried with her husband. All I could focus on were the containers of silicone that were being used to encase my great-aunt and the hydraulic lift supplying the height to the top because my great-uncle always kidded around that no one was going above him in his final resting place. They seal her in. They shuffle us out. They encourage us to walk a little faster. We get downstairs and are greeted by impatient funeral workers and the next mourning family. Really? Really. Thanks for downplaying our grief, our reality. Thanks for making her seem insignificant — I realize we all are in the grand scheme of things, but really? at this moment? Really? Really. Welcome to Caballero Funeral Homes. This entry was posted in Uncategorized on July 9, 2014 by admin. In my twenties, I switched to Origins and started developing a regimen; I became aware of the importance of using SPF to protect my skin from the sun. I alternated between Checks & Balances and Never a Dull Moment face washes, A Perfect World skin serum (protects your skin from free radicals), Have a Nice Day moisturizer with SPF (discontinued), and Night-a-mins face lotion. And now…I just love Clinique face products, make-up (the two times a year I actually wear any), all of it. Highlights: Even Better Essence Lotion, Repair Wear Laser Focus serum, Super Defense eye cream with SPF 20, Youth Surge SPF 15 moisturizer and my favorite: Turnaround Overnight Moisturizer. and any of the face products from Neutrogena, especially the moisturizer for acne-prone skin! Oh, and like my grandmother and mother…I barely use make-up, so you figure out what the real secret weapon is against aging! This entry was posted in Beauty on July 6, 2014 by admin. Hmmm…where shall I begin…Okay, at the beginning. I’m a huge fan. I basically have the emotional maturity of a middle schooler, which is how I understand my students. I blast “Roar” and “Wide Awake” when it comes on or any other Katy Perry song. I once spent an entire karaoke-style evening singing Katy even though I shouldn’t have been (if you heard me, you’d understand). So, you can imagine my excitement when I received tickets to her concert for my birthday! My concert buddy (also known as my daughter) and I arrived at the American Airlines arena, headed straight to our area in the upper levels and then invested in cute t-shirts to remember the moment — I do love my pink tee: . Then we sat down to listen to the first opening act — Ferras, who in retrospect was okay, but at that moment felt as though if I listened too long, I might fall into a deep depression. An hour later, the second opening act, Capital Cities, came on; they are the ones that sing the catchy tune “Safe and Sound” and that is their ONLY catchy tune (the moment they tried to sing Madonna’s Holiday, I left to eat the world’s worst pretzel). Moving on…as we sat and waited, I took notes like “Tick tock Katy. It’s 9:13 and it’s past your target audience’s bedtime…and mine”. We were among a sea of pink, purple, and fluorescent green wigs on the heads of so many kids, one might think you detoured into Disney World. Then at last, she came on with Roar…great performance. The rest of the evening was a blur of scary animated cats that vogue and shop on Rodeo, her songs set to a mix Power 96 can use, and a lot of time speaking with the audience. As I mentioned, Roar was incredibly well done. Her acoustic performance of The One that Got Away was amazing…it reminded me why I was there and nearly brought me to tears (but that’s another blog). 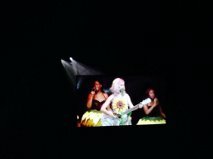 Her final encore performance of Firework was outstanding…we wore special Prism Vision glasses and the entire arena became a kaleidoscope of colors and well, it was simply, awesome. I also need to mention: #MakeRoarHappen; Katy teamed up with Staples to donate $1 million to DonorsChoose.org to help teachers and students in the classroom. I also liked the fact that she was telling a sea of girls and young women to love themselves first and foremost. The One that Got Away – acoustic – amazing!!! This entry was posted in Accessing Education, Cool Places on July 4, 2014 by admin.